Within months of each other, two soldiers, 22 and 32 years-old, died while participating in on-base fitness exercises with the rest of their respective platoon. Autopsies performed on both servicemen revealed the presence of dimethylamylamine (DMAA) in the toxicology reports, according to an Army spokesman. There have been additional mentions of DMAA in situations involving at least five other servicemen (3 soldiers and 2 Marines) who collapsed during heavy military exercise. In recent years, the body-building community and the military community have seen an exponential increase in dietary supplement consumption. The largest selling product is Jack3d (pronounced “Jacked,”) manufactured by Dallas-based company USPlabs. Products like Jack3d contain DMAA, which is an ingredient the manufacturers advertise increases energy, concentration, and metabolism. 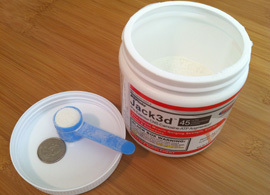 Given the popularity within the military community, DMAA-based products like Jack3d were sold at on-base stores like GNC. That changed in December 2011 after the Defense Department ordered an end to on-base sales of DMAA-based products sold as dietary supplements, including Jack3d. The ban was put in place immediately after the military concluded that the potential common denominator in the deaths of two soldiers and the collapsing of five additional servicemen was the consumption of DMAA products. The Defense Department ordered the temporary ban to investigate whether Jack3d and other DMAA-based products played a role in these mentioned incidents, and to determine if they are essentially safe for consumption. Because of the recent deaths and the negative opinions of experts in the field relayed by the media, the Food and Drug Administration has also raised its scrutiny and awareness of the dietary supplement industry. Several experts have voiced major concerns about the non-regulated sale of DMAA-based products like Jack3d. Edward Wyszumiala is the general manager of the NSF International, a nonprofit organization that the National Foortball League hires to test supplements such as DMAA-based products. Mr. Wyszumiala shed some light on the history and the ensuing business strategies by the manufacturers of these products in a recent article in the New York Times. Initially, DMAA was developed as a nasal decongestant formula back in the 1940s. Decades later, several studies warned that DMAA was more potent than ephedrine, which is a known stimulant. Other voices that have joined the debate include Travis Tygart, the chief executive of the US Anti-Doping Agency, who said that the issues raised by DMAA clearly reminded him of the case of Ephedra. In 2004, the FDA banned Ephedra as a dietary supplement after the death of high profile Major League Orioles pitcher, Steven Bechler, and the deaths of other world athletes. The present ban of on-base sales of DMAA-based products will remain until the Department of Defense completes its review.